COMMENT – I was beyond delighted this morning when I heard the news that Michael ‘No Scots accent for me, Jimmy’ Gove and his wife had adopted a rescue dog. 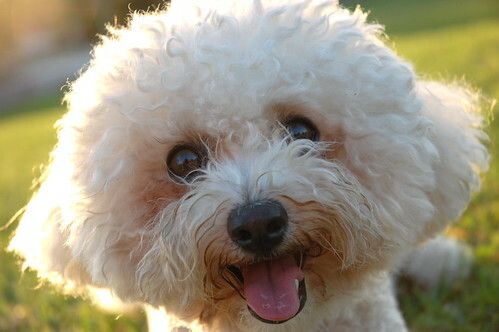 I almost entered a joyful orbit of the Earth when I discovered that the pooch in question is a Bichon Frise, which a friend emailed to inform me means “curly lap dog”. So many satirical possibilities spring to mind that I’m having difficulty prioritising here. Of course, Gove’s current lap dog, Michael ‘Academies can solve the world’s problems’ Wilshire, will be most put out, though I dare say he’ll just re-double his efforts to think up even more ways of torturing teachers in order to win back his rightful place at Gove’s feet. It turns out that Gove has amusingly (so he thinks – the cold winter evenings must just fly by chez Gove) named the dog Boris, presumably because it’s got a raffish hairdo and not because it can read Thucydides in the original Greek. Of course, it would be most unkind of me to suggest that like many people have predicted of his namesake, Boris the Bichon Frisee may well end up making a right old mess for Gove before taking complete control. I do hope Bichon Boris has been neutered. Being the owner of a rescue dog – although my dog is Greek (and therefore can probably kick Bichon Boris’ backside in terms of reading Thucydides) and so the fact that we paid shedloads of cash to bring him home on a plane obviously gives me lots more kudos – I do wonder what life is going to be like for Boris. Will he be told that henceforth he can only be called a ‘satisfactory boy’, as he isn’t meeting the new criteria for ‘good boy’ status? Will his performance in learning new tricks be compared with that of other dogs, including those whose whole lives have been lived in cushy, well-supported homes? Will Boris be told that all these new-fangled ideas about training dogs using rewards and praise are dangerous, Trotskyite nonsense and he can expect no bits of chicken or other snacks recommended by that softy Victoria Stilwell and popular with the canine fraternity, merely for doing as he’s told? Is Gove – as we speak – appointing the controversial *cough* expert Cesar Milan as his dog-training ‘Czar’? (Note to those who don’t know – Cesar Milan advocates the use of negative reinforcement to train dogs.) You don’t need a deal of imagination, either, to picture the scene when Gove does the rounds of boarding kennels and quizzes the proprietors on their ethos, approach to discipline and links with parents. He could get his some of his mates to set up ‘free kennels’, paid for by taxpayers so that his middle class mates don’t have to send their dogs to kennels populated by oiky dogs. Warning: the next section of this piece involves the blatant and shameless crowbarring in of another recent bit of news and therefore those of an easily irritable disposition might want to look away now. I did try to make a better link, honest. An article in the Independent of 16 January had Tim Loughton, a former junior minister at the DfE, comparing life at Sanctuary Buildings with the TV series ‘Upstairs, Downstairs’, in that ministers rarely venture off their own corridors and have little contact with the ‘staff’ and everything that has puzzled me so far about Gove’s reforms suddenly made perfect sense. Anyone with an ounce of sense can see that he’s so enamoured of the past that he’s amalgamated everything he’s ever read, seen or heard into a ‘golden age’, to which it is his mission to help us all return. No doubt this is a process which continues to this day, so if he’s a fan of BBC1’s ‘Call the Midwife’, we can expect Ofsted to be given powers to inspect midwives’ bicycles and check the frequency of provision of gingernuts at nuns’ teatimes. I believe that I can accurately determine that the major influence on Gove’s education policy-making is the ‘Star Wars’ series of films. Anyone who thinks I’ve gone off on a flight of fantasy worse than usual only has to look at the appointment of Gove’s very own Darth Vader, Michael Wilshire, as head of the Ofsted Death Star and the enhanced powers given to the inspector storm troopers. Still not convinced? As soon as I have found the evidence, I shall reveal that the shadow education secretary, Stephen Twigg, is the secret son of Michael Wilshire, who is even as we speak attempting to lure Twiggy to the dark side of the force – it’s the only explanation for his lamentable inability to look any better than entirely useless in his current role and then I shall be completely vindicated. The force will be with me, you might say. Moreover, I’m sure I’m not the only person at this point wondering if Gove’s watched a bit too much ‘Waterloo Road’ and now believes that the schools his mate Wilshaw reckons are ‘failing’ should be lifted up – perhaps by a tornado – and plonked down in Scotland where, re-designated as free schools (despite the fact that Scotland doesn’t have free schools) they will de facto become successful. As Gove is himself from Scotland, it all begins to join up and make perfect sense – there’s no place like home, after all. If I’m right, poor old Bichon Boris is in for a tough time. His only hope, I reckon, is that one day, whilst he’s lying listlessly in the lounge, the film ‘Cujo’ appears on television and gives him one or two ideas. Actually, that’s the only hope for all of us at the moment.